Crater Lake inspires awe. Native Americans witnessed its formation 7,700 years ago, when a violent eruption triggered the collapse of a tall peak. Scientists marvel at its purity: fed by rain and snow, it’s the deepest lake in the USA and perhaps the most pristine on earth. Artists, photographers, and sightseers gaze in wonder at its blue water and stunning setting atop the Cascade Mountain Range. 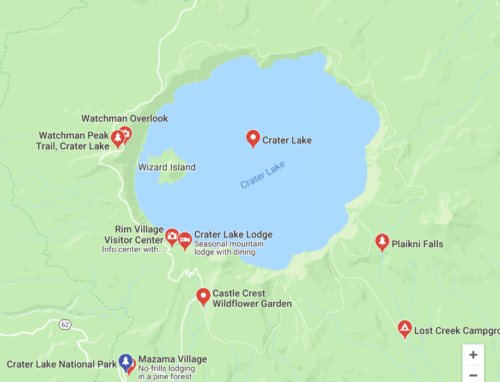 Crater Lake National Park offers year-round adventure and fun, from winter cross-country skiing and snowshoeing to summer camping, boat tours, hiking, and scenic tours around the lake. For additional information about things to do in the park, watch the video below and then scroll down to view some of our favorite activities. East Rim Drive, is more secluded. It has 16 campsites for tents only, cold water faucets, and toilet facilities. Lost Creek is open from mid-July to mid-September. Backcountry camping is also permitted with a permit. Learn more about our Mazama Village Campground sites. 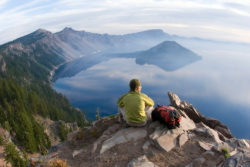 Crater Lake contains more than 90 miles of hiking trails, ranging from easy to strenuous. Many of these trails may be hiked in a single day. Additionally, thirty-three miles of the Pacific Crest Trail pass through the park, offering hikers magnificent views of the lake. Hikers who wish to camp overnight in Crater Lake National Park must get a backcountry permit. Kokanee Salmon and Rainbow Trout are both present in Crater Lake. No fishing license is required within the boundaries of Crater Lake National Park. The lake can be fished year-round except when weather prevents safe access. The only access to the lake is by the Cleetwood Trail located on the north side of Crater Lake. Cleetwood Cove provides about quarter mile of rocky shoreline for angling. Wizard Island is also open while boat tours are running. All waters are restricted to the use of artificial lures and flies. 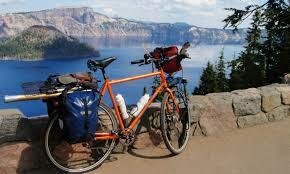 One of the most popular and spectacular bicycle routes at Crater Lake is the 33-mile Rim Drive. The road is narrow with long, steep grades. Most cyclists start from the Park Headquarters area and ride around the lake clockwise, which puts one of the steepest and longest grades at the beginning of the trip. During the winter season, cross-country skiing and snowshoeing are popular. There are nine different skiing trails available, ranging in difficulty. Backcountry camping is available with a permit. Snowmobiling is available just outside the boundaries of the national park. Crater Lake’s premier fine dining establishment features Northwest cuisine made with choice Oregon-grown ingredients. Sample the best of what Oregon has to offer, from the freshest, locally-grown mushrooms and berries to Rogue Valley cheeses and wines. If you would like to make a reservation for dinner (reservations are not accepted for breakfast or lunch), please dial 541-594-2255 x 3217 and follow the prompts. You can also make a reservation online through our reservation system here. The Rim Village Café features “Grab and Go” items including sandwiches, salads, snacks, and hot soups (winter only). This 1,500-square-foot café has a seating capacity of 36 inside and 48 on an adjoining patio. The 2,200-square-foot retail area features a hiking theme with aisles resembling a hiking trail that weaves its way through the shop. The trail is made of various tiles including some that look like local rock. A snow tunnel through the basement of the building to the parking lot makes an easy access for winter visitors. The building is located one block north of the Crater Lake Lodge. The Annie Creek Restaurant, open from early June through late September, is located in Mazama Village, seven miles from the rim of Crater Lake. Seating is available for 120 guests. This fun and friendly family restaurant features American cuisine serving breakfast, lunch, and dinner. Quench your thirst with one of our Oregon beer or wine selections. Since 1876, Fred Harvey, a prominent purveyor of hospitality services and products throughout the Southwest, has lived on in the spirit of our stores in our nation’s historic parks and famous resorts. For a unique selection of memories and gifts visit the Rim Gift Shop located near Crater Lake Lodge or the Annie Creek Gift Shop located at Mazama Village. Originally opened in 1915, the historic Crater Lake Lodge welcomes you with a boldly stated fireplace in the Great Hall. Following extensive renovations in 1995, the lodge also offers an atmosphere reminiscent of the 1920s and immerses visitors in its rustic charm. Each room provides the ideal hotel standards of comfort and privacy in the heart of Crater Lake National Park. The lodge is open seasonally from late-May to mid-October. Located seven miles from the rim of Crater Lake just inside the south entrance gate of Crater Lake National Park, the Mazama Village Campground has 214 tent and RV sites, accommodating tents up to 12’ x 12’ and RVs up to 50 feet in length. The campground is open from mid-June to late September/early October, weather permitting. From June 1st to June 30th, campsites are available on a first come-first serve basis only. Advance reservations may be made for dates beginning July 1st, and may be made online or by phone for a limited number of tent and RV sites. The remaining sites are available on a first-come-first-served basis at the campground. RV campers may pitch up to 2 tents in their RV sites if space allows, but RV sites may not be reserved for tents exclusively. All sites with hookups are available on a same day, first come, first serve basis. The cabins at Mazama Village are located seven miles from the rim of Crater Lake and are situated in a peaceful Ponderosa pine forest setting. Each of the 40 guestrooms feature one or two queen beds and a private bath with a stall shower. There are no televisions, telephones, or air conditioners. Accessible rooms are available, but none will have roll-in showers. To see available ADA-compliant rooms, please check the “ADA/Accessible Rooms” checkbox in the online reservations application or call Central Reservations at (888) 774-2728.